available for bloggers to review. We were just beginning our school year, and I thought it would be the perfect addition to ensuring I stayed focused on the Lord throughout our school year. Since receiving it I have been using it for my morning devotions, beginning with the Good Morning Girls’ Bible Study and ending with the included Homeschool Devotional for the day. Each devotional is a tidbit covering struggles that homeschool moms face, and I have found it to be a great bit of encouragement to start my day. However I was a bit disappointed as there is not a list of each devotional by day within the Bible. So you have to search for each day unless you were to use a bookmark daily. For someone who reads throughout different parts of the Bible each day, I found this disappointing. This Bible is very basic, and other than the daily mini devotional it does not include anything special. I honestly thought I would love this Bible so much that I would use it above my others daily, but I don’t my other Bibles offer study helps, concordances, etc. 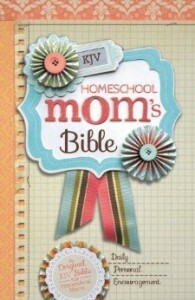 If you are looking for a good basic Bible with mini homeschool mom devotional to kick start your day then this is a great pick! Love that it’s KJV which is so hard to find in many books.Will pass this information onto my daughter and daughter-in-law! Yes it is hard to find! That’s why I was so excited to find it! Blessings!